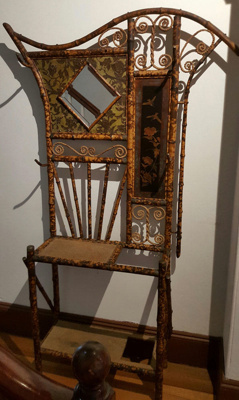 This hall stand is an excellent example of late-Victorian "Japan-style" bamboo furniture. 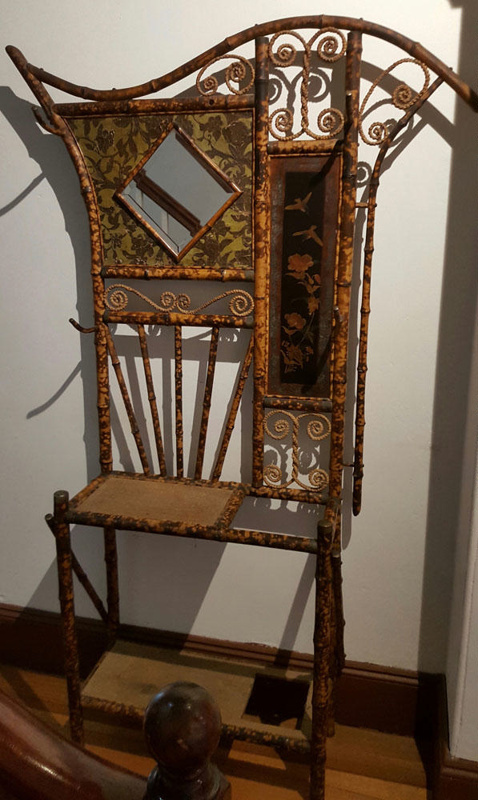 The asymetrical hallstand has a bamboo frame; ornately decorated with a hand-painted laquer panel featuring a traditional design of flowers and birds in red and gold on a black background; a diamond-shaped bevilled mirror, panels of embossed `leather' paper and areas of curled 'rope'. The hall stand also feaetures an unusual curved piece of bamboo at the top of the stand. An imposing piece of furniture such as this hatstand would have been found in homes such as Comerang (Bodalla), Kiora House (Kiora), Braemar (Moruya) or Lake View (Bergalia). During the Victorian period there was a revival of the taste for bamboo furniture in this style. All things Japenese fascinated the Victorians as Japan had remained virtually a closed country until the 1860s. The first substantial collection of Japanese art to be shown in England appeared in the 1862 International Exhibition. In the years 1869-1935 there were well over 250 registered bamboo furniture producers in Britain. The majority of these firms were based in North and East London where considerable numbers of furniture manufacturers had congregated by the last third of the 19th century. Other producers were in major provincial industrial towns such as Birmingham, Leicester and Nottingham. Most firms advertised their goods wholesale, selling in bulk to general furniture retailers. The materials used by these factories for this bamboo furniture came almost solely from Japan. Several firms were importing bamboo poles alone, which, when considering their cheapness, gives an indication of just how great demand must have been.